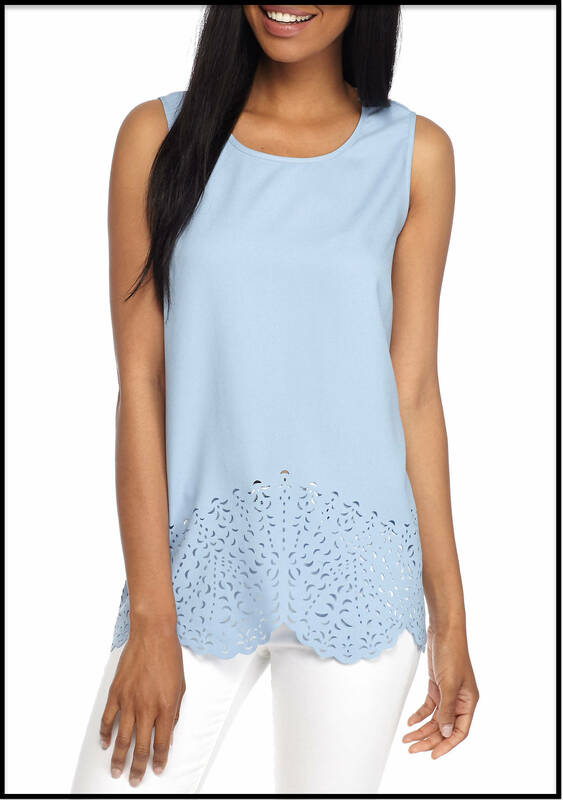 Look here to get Free Fashion Tips, along with a solid knowledge of the world of fashion design. 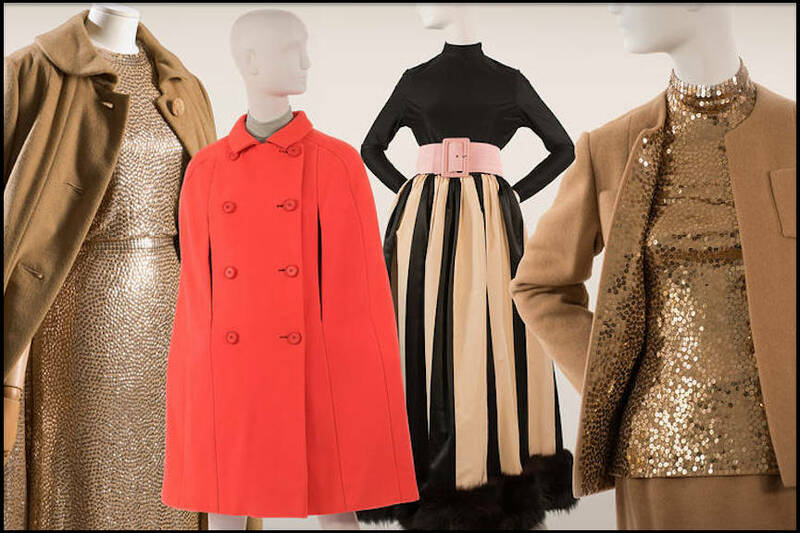 See this visual list of tools, textiles, wearable art, and all things fashion, from bygone times to the present day, and from all over the world. Scroll further down for related links to fashion schools Near You, Fashion outlet stores Near You, and Free sewing patterns with instructions and Fashion Tips included. MECHLIN LACE: A type of lace with a light, silky floral pattern. MELTON: A heavy, tightly woven fabric that resembles wool felt. MERCERIZATION: A process that gives cotton fabrics a smooth, shiny finish. 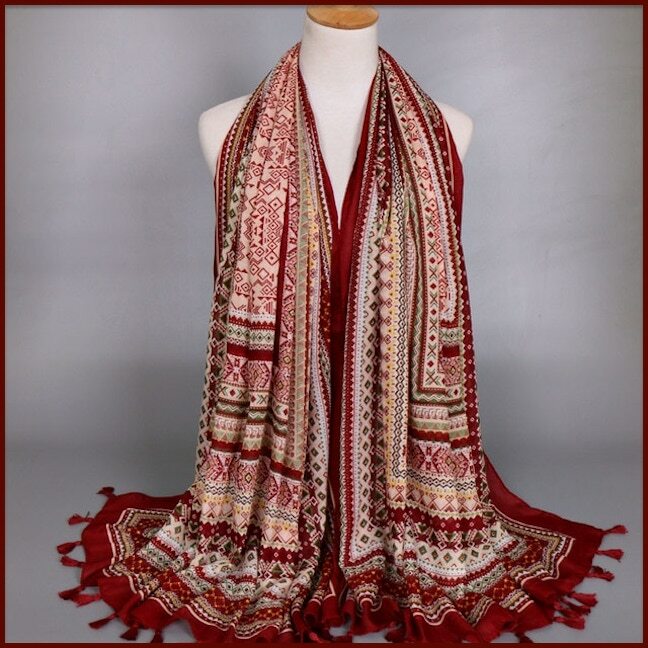 Shown below, a mercerized, bohemian style cotton scarf from India. MERINO WOOL: A very soft and versatile wool, harvested from the Australian Merino sheep. MERMAID: A type of dress that is close-fitting down to the knees, then flares out sharply toward the hem. MESH: A porous fabric with a netted structure. Wear something form fitting underneath the mesh (such as lingerie or a bodysuit), which contrasts with your natural complexion. MESTA: A textile made from plant fibers, also known as kenaf. 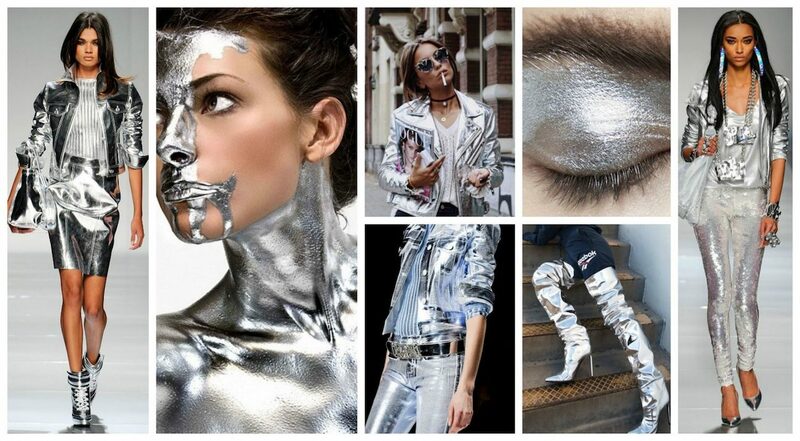 Gold and silver metallic fashions look best when paired with red or black. MICRO: A dress (or skirt) that is as short as a dress (or skirt) can be, and still be a dress (or skirt). A micro mini covers only the buttocks, leaving the entire leg exposed. There are numerous fashion tips on how to wear a micro mini. For instance, you can pair your micro mini with a crop top and thigh high boots. Or you can pair it with a bodysuit, leggings, and a half jacket. MICROFIBER: Super fine synthetic filaments that retain their shape when woven into textiles. 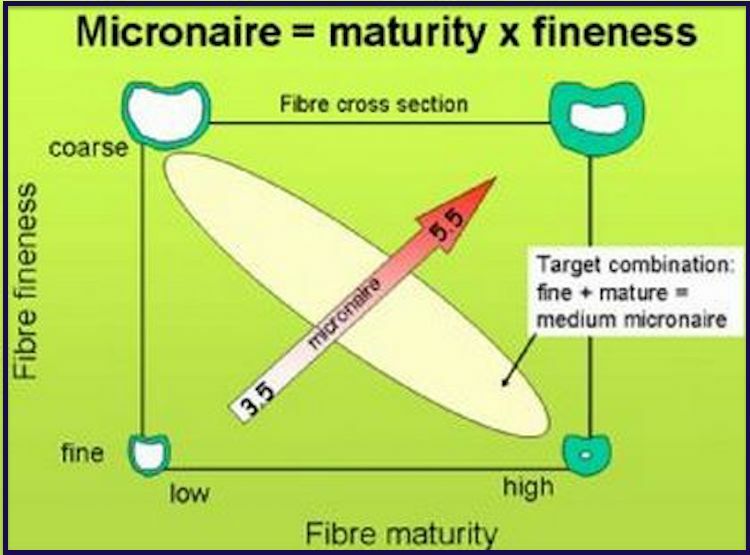 MICRONAIRE VALUE: A technical measurement of cotton fiber quality, reflecting both fineness and maturity. MIDI: A dress of medium length, hemmed within a few inches of the knees. 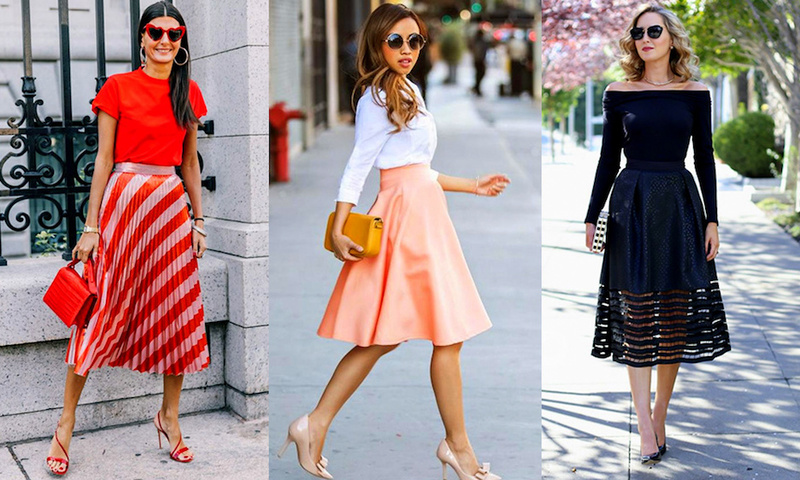 Here are some fashion tips for wearing a midi skirt or dress. Wear your midi with a blouse and blazer. Pair the ensemble with an open-toed shoe style. 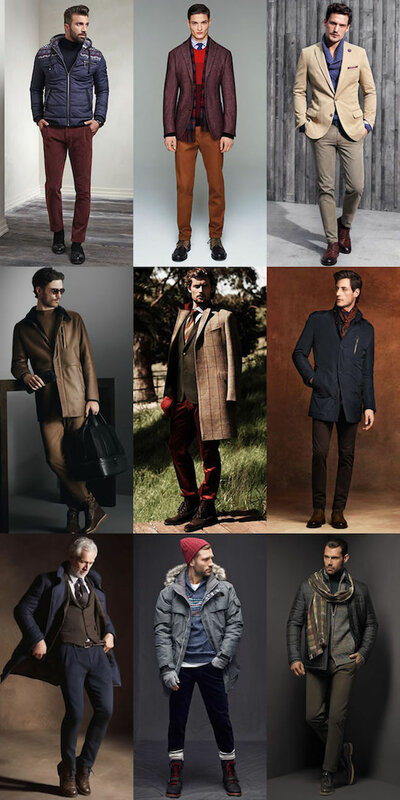 Or copy any of the looks shown here. MID CALF BOOT: A boot that reaches roughly halfway between the ankle and the knee, such as a cowboy boot. Female fashion tips for mid calf boots include pairing them with a midi, or with your favorite pair of skinny jeans. MILANESE: A knit fabric with fine ribbing on the face, and diamond shapes on the "wrong" side. Milanese is often used in lingerie. 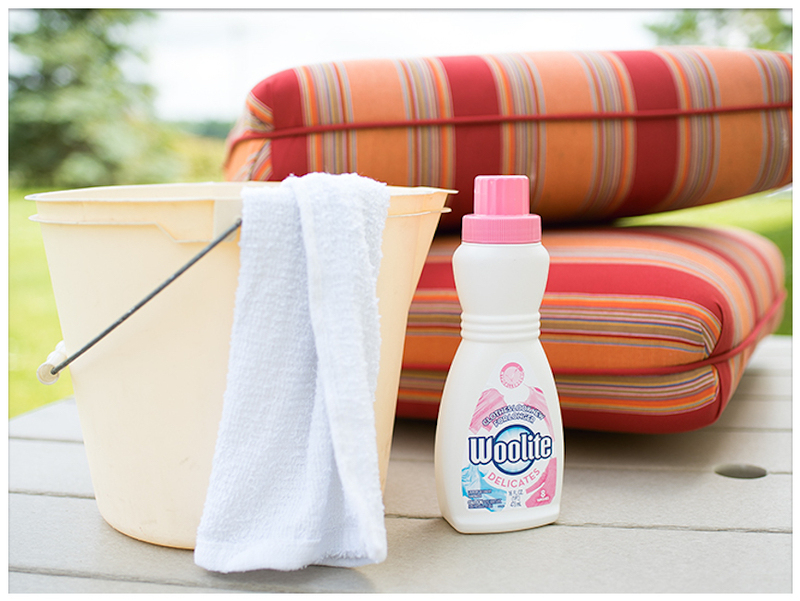 MILDEW: A fungus that can appear on fabrics, and may cause discoloration and/or a funky smell. Fortunately, you can always google fashion tips for removing mold and mildew from fabrics. 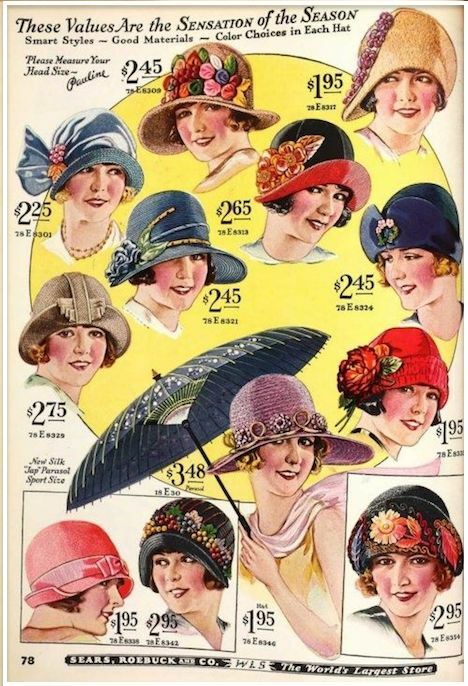 MILLINERY: Ladies' hats and headwear. Shown below, a millinery advertisement from the 1920s. MINI: A short ladies' dress, hemmed no more than 6 inches below crotch level. For fashion tips on styling a mini, see any of the looks shown below. MINK: A small animal known for the beautiful color and silky smooth texture of its fur. 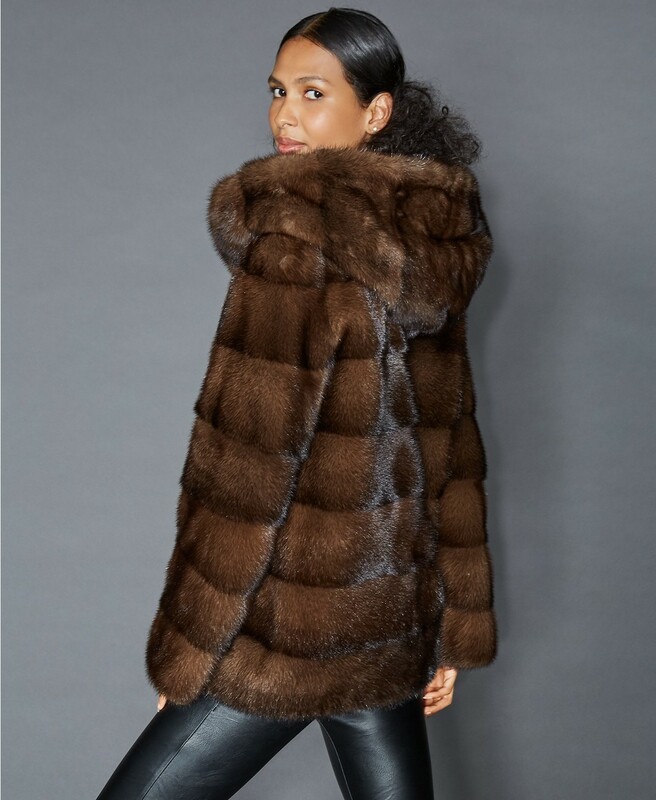 Minks are used for making ladies' coats, wraps, and stoles. Need fashion tips for wearing mink? Wear a faux fur substitute. It's less expensive and you won't even notice the difference. MOCCASIN: A soft shoe, originally made of leather with a rawhide sole, sewn with leather cord, and sometimes lined with rabbit fur. Initially designed by Native American people, moccasins are sometimes embroidered with beads and/or porcupine quills. Need fashion tips for wearing moccasins? Wear faux fur-lined moccasins without socks. Pair them with dark wash, straight leg blue jeans. Shown below, a pair of crocheted moccasins. MODAL: A natural fiber made from spun beechwood cellulose. Fabrics made with modal tend to be shrink-proof and fade-resistant. MODESTE: An overskirt, typically worn by Muslim women. MOHAIR: The long, lustrous hair of the Angora goat, mohair is renowned for its softness and durability. Fashion tips for wearing Mohair? Don't! Mohair has been banned by many top designers for ethical reasons. MOIRE: A fabric of silk, wool, or cotton blend, distinguishable by its wavy appearance. 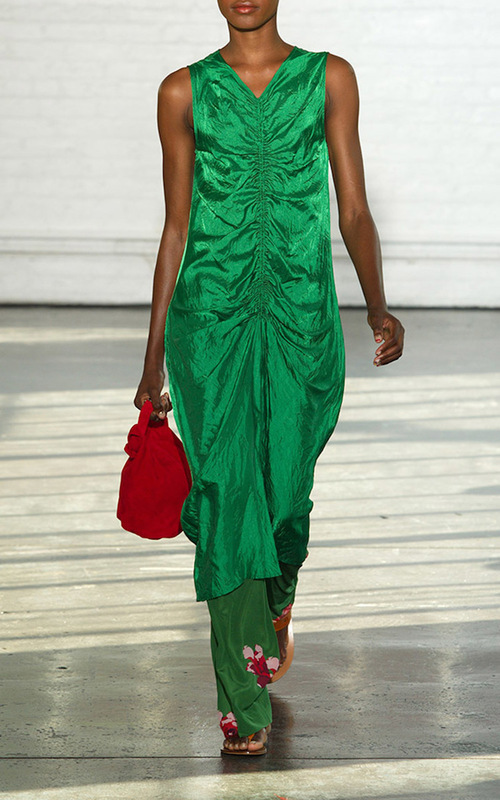 Shown below, a satin moire print dress by Victoria Beckham. MOLESKIN: A heavy, durable cotton fabric with a short, thick, velvety surface resembling suede. Shown below, a collection of men's moleskin rousers. MONK'S CLOTH: A coarse fabric loosely woven with a basket weave. Typically used for home furnishings, afghans, and embroidery. MOSS CREPE: A grainy woven fabric used for ladies' dresses and tops, among other things. 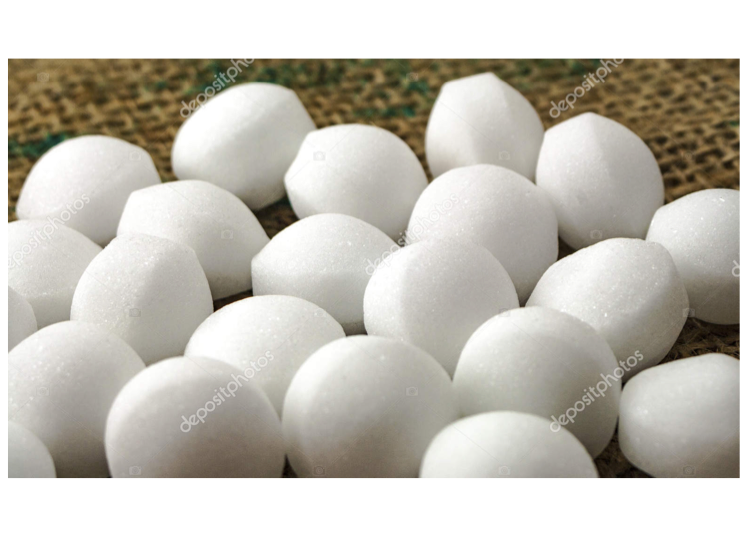 MOTH BALLS: Small balls of chemical pesticide, placed in closets to prevent moths from eating the fabric. MOUSSELINE: Any crisp, semi-opaque fabric. 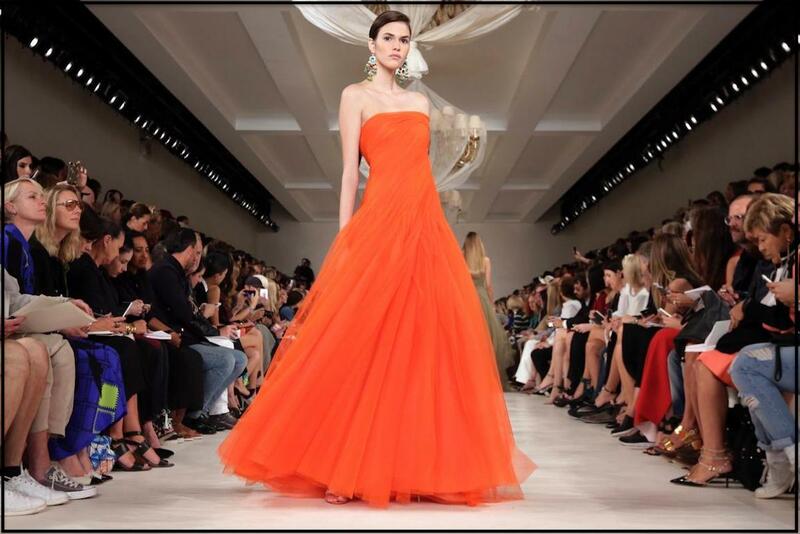 Below, a model wears an orange mousseline dress at New York Fashion Week. 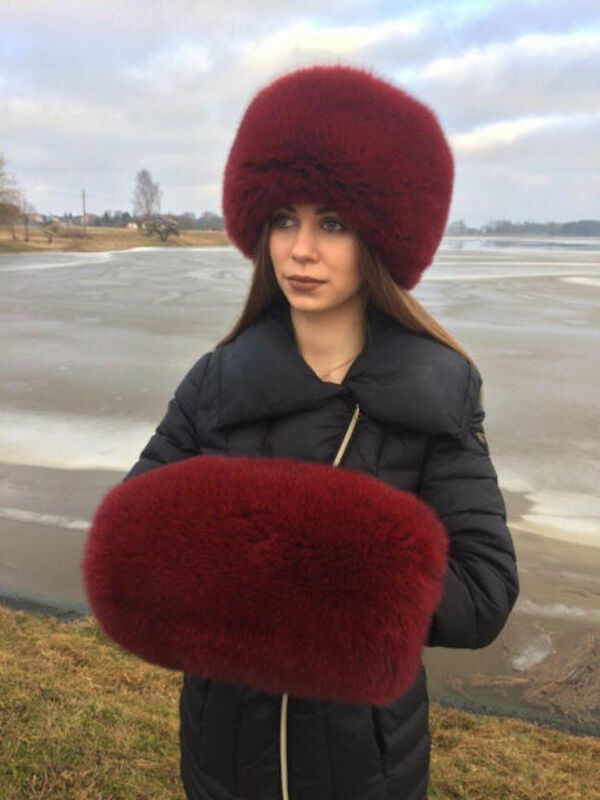 MUFF: A fur band worn around the hands. MUFFLER: A heavy neck scarf. MUGA: A type of wild silk. MULE: A backless ladies' shoe style, typically featuring a closed toe. Fashion tips include pairing mules with casual spring fashions. MULL: A soft, thin woven cotton fabric. 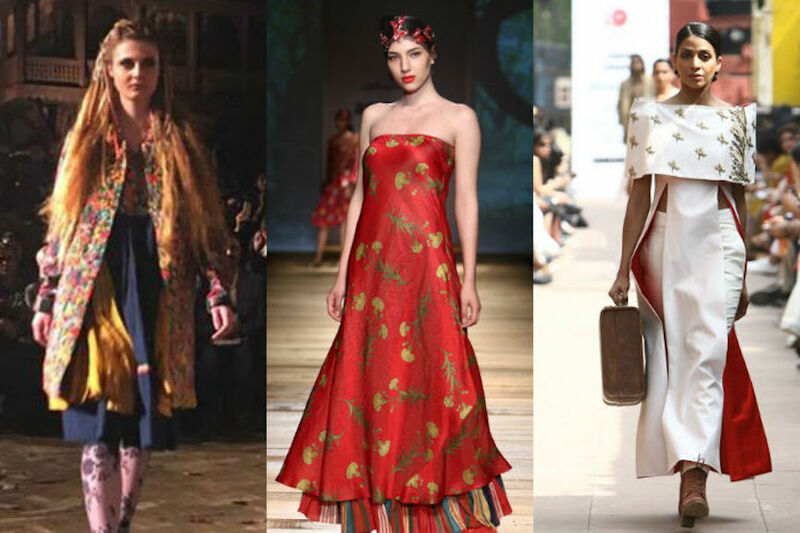 Shown below, a Chanderi mull printed jacket and top at Lakmé Fashion Week. MUMMY DRESS: A form-fitting dress constructed by wrapping a very long strip of fabric around a dress form. More commonly known as a Bandage dress. MUSETTE: A small, square bag with a shoulder strap. MUSLIN: A sheer, lightweight cotton fabric that is less expensive than many fabrics. Fashion tips for muslin cotton include using it as backing for garments and quilts, or using it as practice material for any new cotton fashion design. 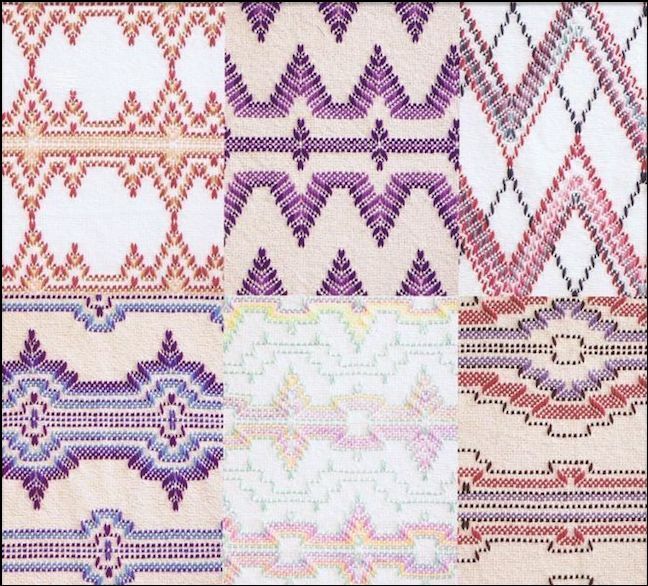 MUTTON CLOTH: A kind of loosely knitted cotton fabric. 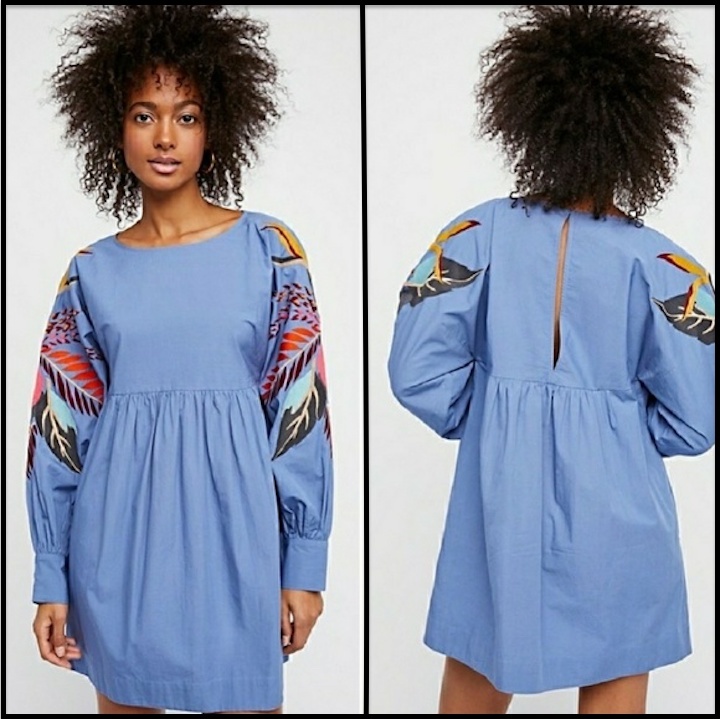 MUUMUU: A loose, unfitted, colorful Hawaiian style dress that hangs from the shoulders. Shown below, Project Runway's Heidi Klum rocks a peacock blue muumuu. Look Here Right Now for your First FREE, FAST AND EASY SEWING PATTERN! Full instructions and Fashion Tips included. 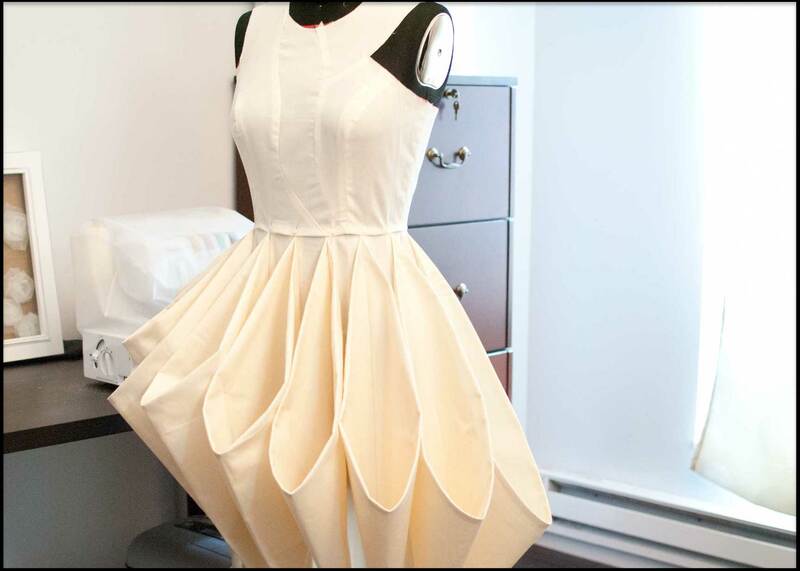 Get all the Fashion Tips you need at Fashion Colleges Near You. FACTORY OUTLETS IN EVERY STATE features a detailed list of outlet stores with discounted prices on many designer fashion brands.